Jerry has served part-time on the North Goshen pastor team since 1989. He is a graduate of Goshen College and studied at Anabaptist Mennonite Biblical Seminary (Elkhart, IN). He and his wife, Ruth Ann have three married sons and seven grandchildren. 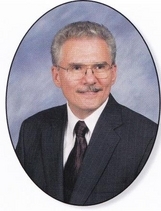 Jerry worked for Bayer Corporation in International Quality Assurance for thirty-seven years. Jerry enjoys growing and hybridizing dahlias and grand parenting. Izaete has been serving on the pastoral team for the past several years. She previously was a pastor at a Mennonite Church in Recife, Brazil. Izaete is married to Tim and they have a son, Natan, and a daughter, Alaiza. Izaete also works part-time with special education at Parkside Elementary School. Being born in Brazil, her hobbies include cooking Brazilian food.